A Wetroom is an open shower space that blends seamlessly with the surroundings. Originally, used in leisure centres and public swimming pools they have become the latest life-style trend for the domestic market. A wet room is a room that has to be completely ‘tanked’, which means the floor and walls are water- proofed to prevent leaking and to allow the entire space to act as a shower area. Following tanking the floor is tiled and the water runs away into a drain. The drain outlet is built into the floor so there is no raised tray. The gradient of the floor, waterproofing and drainage are the three main considerations. In addition to this the quality and reliability of the products used are an important factor. Always buy from an established U.K. company who have a team of trained engineers local to you. Sound installation and good maintenance go hand in hand. Can a wet room be installed anywhere? A wet room can be installed in most homes, providing under floor drainage allows. Even unusual places, like understairs or attic rooms and basements, can be converted by using Saniflo small bore macerators and pumps. Alternatively, Saniflo now produce the Showermatic pump which is ideal for wet rooms to maximise the use of space, no matter how large or small. The Showermatic is a low access shower waste water pump which quietly pumps away the water from a wet room or shower room where gravity drainage is insufficient. How is the Showermatic different to other manufacturer’s products? It has a unique gully sensor which when activated by water movement pumps the water away. What is its flow rate? Wet rooms deal with a lot of water so the pump is able to take up to 12 litres per minute. No it is very quiet in operation thanks to its peristaltic design. Can it be used with a conventional shower tray? Yes it is compatible with shower trays, level access sheet flooring and can be used with tiled floors. Do I need to fit a shower screen? If your entire wet room is properly tanked then a shower screen is not essential. But if there are areas of the room you wish to be kept dry then a minimalist screen from the Kinedo wet room range is ideal. Does Saniflo produce other products that are ideal for the less abled? 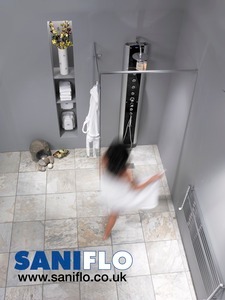 The Sanilife range from Saniflo covers these needs. The wet room can be paired up with their Sanimatic range which allows your choice of toilets and basins to be adjustable. The Sanimatic basin is compatible with wall mounted basins. Its ergonomic control pad adapts the washbasin to your height at the touch of a button. Thanks to a motorized system (which is able to carry a load of up to 250kg) the Sanimatic toilet assists people of all heights in sitting down and getting up. Simple and comfortable this variable height sanitary system is a technical solution perfectly adapted to accessibility requirements. All Saniflo products are guaranteed for two years.